Glass kitchen sink, inset, single bowl with a drainer, made of beautiful, easy to clean toughened glass and premium 18/10 stainless steel material. Left or right-handed. Available in black and white or any other colour/pattern or design of your choice. Free delivery within 4 to 31 working days (UK mainland) depending on colour and stock availability. Lead time for bespoke designs and colours is 4 to 6 weeks. Pop-up plumbing kit included in the price. 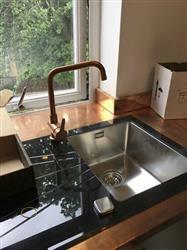 The sink and drainer look a-maz-ing, don’t get me wrong, beautiful to look at, works as a sink brilliantly…however it doesn’t drain that well. While the grooves in it look deep, water can happily sit on the drainer watching the world go by with no encouragement to go forth into the sink. Also, being black glass it does show up any water drying mark/faint limescale rings. These can be cleaned off with Windowlene, but I’m not in a particularly hard water area. Oh, and the sink was DHL’d from Slovenia and arrived a day earlier than expected. 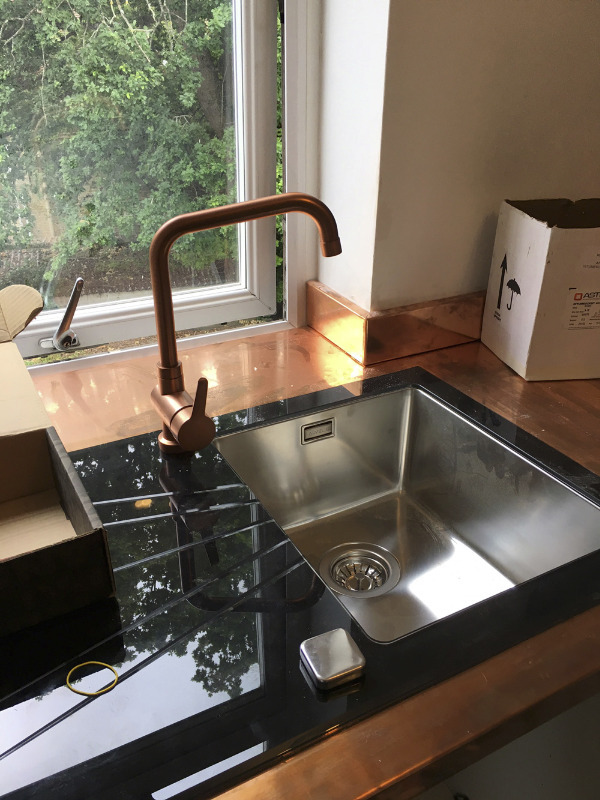 Fantastic service from Olif, and very happy with how the sink looks and performs, if only the draining grooves were deeper and had more of them it would be 5 stars. Dimensions: 860 x 540 x 211 mm Glass kitchen sink, inset, one and a half with drainer, hand-crafted from toughened glass and premium 18/10 stainless steel material. Available in white and black glass. Free delivery within 4 to 31 working days (UK mainland only). 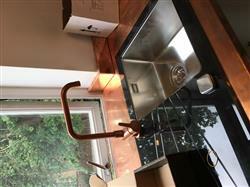 Pop-up plumbing kit, strainer bowl and liquid dispenser included in the price.